Harry: You are every man's fantasy. You're like Ali MacGraw and Bridget Bardot had a baby. You should be the most famous person in the world right now. Roger: You already emptied the place out, you want to defile it as well? Marie: Please, take advantage of me. Permalink: Please, take advantage of me. Pete: I don't know why we couldn't swing by your apartment. What will the client think that you're renting clubs? Don: Megan's moving her things today. Pete: I didn't know you were still going through that. Permalink: I didn't know you were still going through that. Don: Who are you hiding from? Roger: I've got two secretaries and three telephones. I feel like Marlon Perkins is chasing me on the Savannah. Hiding is pointless. Diana: What do you want? 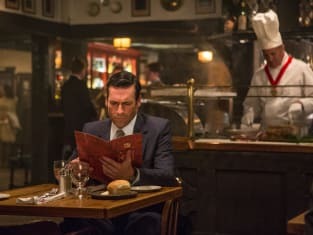 Don: I want to eat dinner with you, even if it's five minutes at a time. Permalink: I want to eat dinner with you, even if it's five minutes at a time.